Let us help you learn, advance and succeed! The Mississauga Secondary Academy Tutoring Centre (MSATC) provides students with the key skills needed in order improve or upgrade your high school course marks outside of day school, or gain a better understanding of your current course material. In the mean time, our Fast Track Language Proficiency program has helped hundreds of students achieved their targets in TOEFL, IELTS, SAT, and other standardized English Language tests. We also provide tutoring sessions of skill and interests to enrich students' extra-curriculum activities. 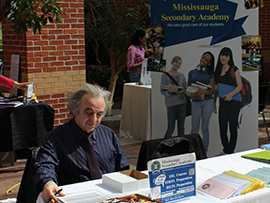 •Mississauga Secondary Academy is a Licensed and Inspected Private High School with the Ontario Ministry of Education. •We have excellent staff. Our teachers are highly experienced and Ontario Certified instructors. •Everyone is welcome! Both local and international students are welcome at our school. •Our smaller class sizes ensure a higher success rate. •We are conveniently located across the street from Square One Mall in the Mississauga Region of Peel.